It could debut at next month's 2019 New York Auto Show. After Mercedes unveiled the new 2020 GLC facelift at the 2019 Geneva Motor Show earlier this month, it comes as no surprise that the automaker is preparing to unveil the new GLC Coupe facelift. Mercedes has uploaded a short teaser video on social media to preview its upcoming BMW X4 rival. Like the regular GLC, the teaser confirms the updated GLC Coupe will be getting new LED headlights for the 2020 model year. These come as standard for the regular 2020 GLC featuring "torch-design” daytime running lights, while full-LED headlights with Multibeam tech can be equipped for an extra cost. We also get a brief look at the SUV's tweaked full-LED taillights, which look slightly different from the ones found on the 2020 GLC. 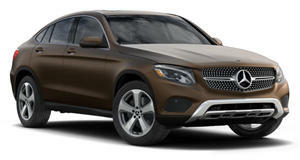 We don’t get a look inside the new GLC Coupe facelift, but the standard non-coupe model gives us an idea what to expect. Inside, the 2020 GLC comes with a 12.3-inch digital instrument cluster and an infotainment system available with a 7- or 10.25-inch screen as part of Mercedes’ new MBUX system. As for engine options, the GLC Coupe should also inherit its standard sibling’s powertrain. In the US, the 2020 GLC will only be offered with a more efficient turbocharged 2.0-liter gasoline unit, codenamed the M264, producing 255 horsepower and 273 lb-ft of torque. A nine-speed automatic still sends power to the rear wheels or to a 4Matic AWD system. Mercedes hasn’t said when the GLC Coupe facelift will arrive only that it’s "coming soon.” The next major event on the auto show calendar is the 2019 New York Auto Show next month, so we could see the 2020 Mercedes GLC Coupe debut at the Big Apple. Don’t be surprised if it breaks cover online earlier.